Approx. 500L of kerosene oil leaked from the oil tank. Very strong oil odours and high PID readings in the play room, utility room, a section of the hallway and living room. Widespread oil odours throughout the house. Significant volumes of free oil around the exterior of the house. 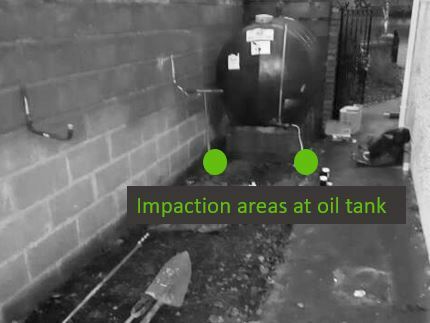 Impact confirmed beneath a large section of the house, with strong oil odours and elevated PID readings recorded against the foundations of the external and internal walls. Installation of a vapour extraction unit (VEU) at the eastern gable wall of the property to extract strong oil vapours from inside the building. Advancement of an interception trench along the northern gable of the house, installation of recovery sumps, a pump and treat system to recover free oil at the property to prevent further impact to buildings and spread of the plume to the wider environment. Removal of the boiler and associated pipework to allow for excavation of impacted material. Removal of the oil tank to be set up in a temporary location during works. Removal of all furniture from the playroom to allow for internal excavations. Protection of door frames, windows and floor coverings inside the house which may be impacted during works. Removal of units and appliances from the utility room to allow for excavations. Set up of site safety requirements. Break out and removal of the concrete apron from the front, eastern gable and a section along the rear of the property. Excavation of impacted fill material and soils down to the depth of foundation around the house and around the location of the oil tank. Break out and removal of the concrete floor inside play room to allow for access to the impacted material beneath. Fill material inside the play room was excavated down to the depth of foundation. Utility room floor broken out and fill material excavated to foundation depth. A trench was excavated inside the living room to foundation depth, to remove grossly impacted material and give access to impacted blockwork. A trench was broken out and removed inside the hallway and all material was excavated to foundation depth. Following excavation works, a full blockwork assessment was carried out to determine the extent of blockwork removal and replacement. Blockwork replacement took place in accordance with structural engineer’s method statement. An inoculation network was installed to aid the application of specialised bioremediation solutions. 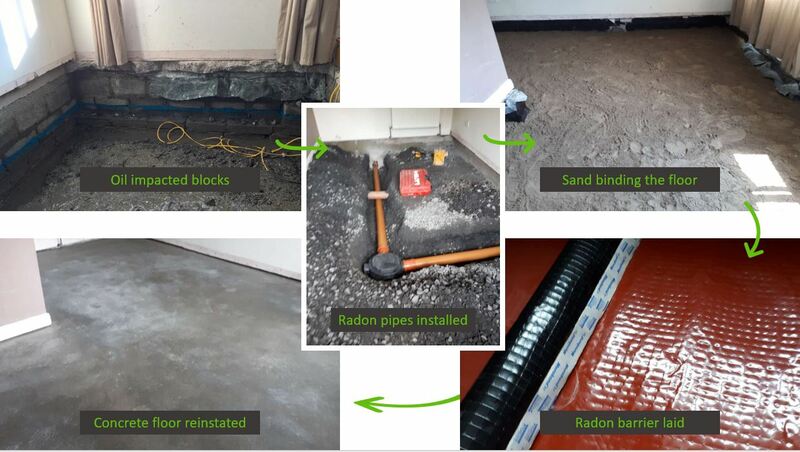 An in-situ remediation programme was implemented to treat residual contamination in soils beneath the depth of excavation, using chemical oxidation followed by application of specialised bioremediation solutions to enhance natural attenuation. All excavated material was removed for appropriate disposal and/or treatment at a licensed facility. Reinstatement of excavated areas and concrete floor sections inside the house. Reinstatement of concrete aprons around the house. Reinstatement of impacted landscaped area. Reinstatement of the oil tank plinth. Reconnection of boiler, associated pipework and re-commissioning of heating system. Final validation sampling undertaken to examine soil and interior air quality at the previously affected areas. “All of the Verde team that worked on our oil spill issue were fantastic. They were prompt, accurate and very understanding of the distress of our situation. In a very stressful time it was often the Verde team getting me through, even when it wasn’t their role, explaining things, helping our movers move furniture, and minding our cat whilst doing their own job very professionally. I was so impressed by all the team, especially Paul O’Sullivan who went above and beyond including looking after our cat who we were unable to re-home when we had to move out which caused us huge worry. Even my neighbours commented on how prompt, hard working, quiet and tidy the Verde crew were.